CNG: The Coin Shop. CELTIC, Southern Gaul. Insubres or Salluvi. Late 2nd-early 1st century BC. 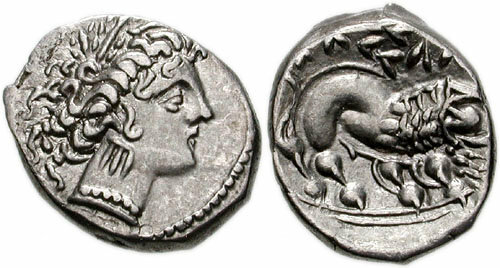 AR Drachm (15mm, 2.89 g, 3h). Imitating Massalia; 'scorpion' type. CELTIC, Southern Gaul. Insubres or Salluvi. Late 2nd-early 1st century BC. AR Drachm (15mm, 2.89 g, 3h). Imitating Massalia; 'scorpion' type. Female head right / Lion standing right. CCCBM II S13; KMW 120; de la Tour 2126. EF.